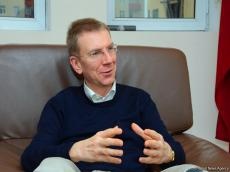 Latvia is interested in working together with Azerbaijan on land transport connections, Minister of Foreign Affairs of the Republic of Latvia Edgars Rink?vi?s said in an interview with Trend. "Transit is an important part of Latvia’s economy. Together with related industries, it accounts for 3 percent of our GDP. Recognizing the sector’s importance, Latvia is constantly working to upgrade its capacity and offer better services to our partners. Improvement of transport networks and infrastructure is also a priority for the European Union’s Eastern Partnership policy, which we actively support," said the foreign minister. "As we see it, there are two important international transport corridors passing through Azerbaijan: the North-South International Corridor, eventually with a connection to the Baltic Sea region; and the Transport Corridor Europe Caucasus Asia (TRACECA), which is a part of the New Silk Road and creates a strategic link between the Caspian Sea and the Black Sea," said Rink?vi?s. "In 2018, Azerbaijan opened its Trade House in Riga seeking to build stronger economic cooperation with Latvia. Azerbaijani companies have shown an interest in developing contacts with Latvia in the food, pharmaceutical, environmental, agricultural and industrial sectors. Latvia would welcome investments from Azerbaijan in ports and logistics centres. This April, we look ahead to hosting a business delegation from Azerbaijan. Hopefully, this visit will contribute to boosting our economic exchanges," said Rink?vi?s.